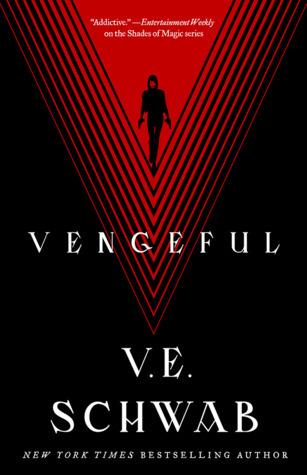 So I’m a bit late to the party on this, but I read Vengeful by VE Schwab right after release and I have some thoughts on what worked and what did not. I know a lot of people really loved this book and identified a lot with a new character, Marcella. Personally, I found her role confusing. I want to talk more about this book because I just keep thinking about it, which is a good thing! I would love to know your thoughts, so please read with an open mind and respond in the comments! Though I did not write a full review of the first book in the series, Vicious, I loved it. I gave it 5 stars and would give it more if I could. I thought it was a brilliant, dark, and well-contained story. I was really looking forward to Vengeful, and so I have to acknowledge that some of my misgivings could simply be due to too-high expectations. That being said, there is a part of me that wishes Vicious never got a sequel. VE Schwab has a bit of a pattern with her book series. In the first book, the cast of characters is fairly small and tight-knit. This allows them to be really well established in the narrative. In book 2, a whole crew of new characters is introduced to cause trouble and move the story along. This happens in The Monsters of Verity, Shades of Magic, and now in the Villains series as well. So far, I have only felt it worked really well in Shades of Magic. The new characters there felt just as real, their motivations were equally strong, and they added something meaningful to the story. I did not find that to be the case in the Villains series. Marcella and June were the 2 major additions in Vengeful. As in Vicious, the book jumps around between different points in time. Schwab does this so deftly and it’s a part of the storytelling I enjoyed in both books. We get to see Marcella and June get to know each other and develop a working relationship. Early on, I was really into Marcella’s story and her desire to pull away from everyone trying to control her life and forge her own path. She does this by making her voice as loud as possible and forcing everyone to look at her and how powerful she is. June takes the opposite approach, and almost no one ever really sees her true face. June is a shapeshifter of sorts and uses that ability to exact justice. These 2 characters are really interesting to watch, but ultimately I was let down by them. As Marcella’s story unfolds she becomes more and more unhinged. The end of her story in Vengeful is obvious from the halfway point. Her erratic and boisterous behaviors get her into a lot of trouble and make her control others in some of the same ways she was controlled. Her power starts to turn her into the kind of person she hates. Though she started as a beacon of female empowerment, she winds up being another force of persecution. This really made me confused about her voice and her purpose in the broader scope of the story. It is certainly a cautionary tale about the corrosive influence of power, but I wanted Marcella to smash the patriarchy and still be a positive female figure. Sadly she smashed the patriarch and tried to replace it with something worse. My qualms with June are a bit more straight-forward. I just wanted more of her in the story. Her personality, past, and motives are all shrouded in mystery throughout the book. There are events and relationships that we just don’t see in the narrative. While those things weren’t necessary to move the story along, it left me with a lot of questions about who June is. I am hoping for a 3rd book if only to learn more about her. I want to talk a bit about the more established characters as well. The opening section of Vengeful was so great for me. I cried, and that so rarely happens for me in books! I loved getting to see Victor and Mitch again, their dynamic never disappoints. Sadly though, I felt that some of the logical/analytical plotting that I loved from Victor was missing in Vengeful. He was pigeon-holed into a plot line that didn’t allow for the creative problem solving I loved from him in Vicous. Syd also had a storyline that just didn’t make logical sense. Her actions felt so plot devicey, and only really served to get a large number of characters in the same place at the same time. It didn’t have a deeper meaning for Syd herself. While I enjoyed the book for its stabbyness and I love the idea of EOs and seeing different sets of abilities, I think it was weighted down by too many characters and conflicting motives. Keeping the cast smaller could have made the story stronger. I would have loved if Vengeful focused a bit more on Syd herself, along with Victor and Eli. This would have allowed for a strong female presence in the story. Marcella was simply too big a personality and she overtook the story without adding meaning. I may enjoy the book more on a reread, but my first time through I just felt disappointed. So, let me know what you thought of Vengeful! I would love to discuss these ideas more with other readers. ← The Halloween Book Tag!